Your in hand, in the boat, problem solver. Have you ever been on the water watching a crew and wondered just what drill would fix that rower with the perpetually “skying” blade? Wonder no more, introducing the Down and Dirty Drill Card! Meant for coxswains and coaches alike you now have a cross refernce of all the most popular drills, and the parts of the stroke they impact. From the simplest pause drills to the challenging “Russian Drill” you now have the tool to make a difference immediately. On the back side of the card you have a position by position illustration of the full rowing stroke! As your rowers work through the drill you can compare what you are envisioning with the illustration on the card and what you are seeing in front of you. 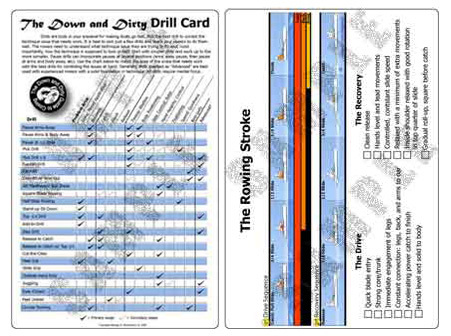 Never second guess what the best solution is again, because you have the Down and Dirty Drill Card! Click on Order above to get your copy today!